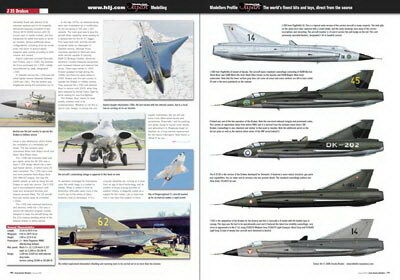 In the August issue of Scale Aviation Modeller magazine from UK was published set of five profiles of SAAB J-35 Draken. This profiles are joined to the main feature Modellers Profile No 13 about this plane and this feature is sponsored by Hobby Link Japan. Profiles are part of the article Angel Interceptor which briefly describe operational history of this very unique airplane. These very nice articles contain all important info about its service and variants and it is packed with excellent images. Middle pages contain scale drawings of this airplane but before of these pages, on page 7477 is color profiles of the plane. Also this feature include several various pattern used by the type. Rests of the few pages are presented model build and accessories for this plane. This entry was tagged Draken. Bookmark the permalink. hey, hows it goin. i just wanted to say that Srecko Bradic was the name of my grandfather. hi! Is there any chance you could post that picture in a higher resolution? I’d really like to read the text in it!